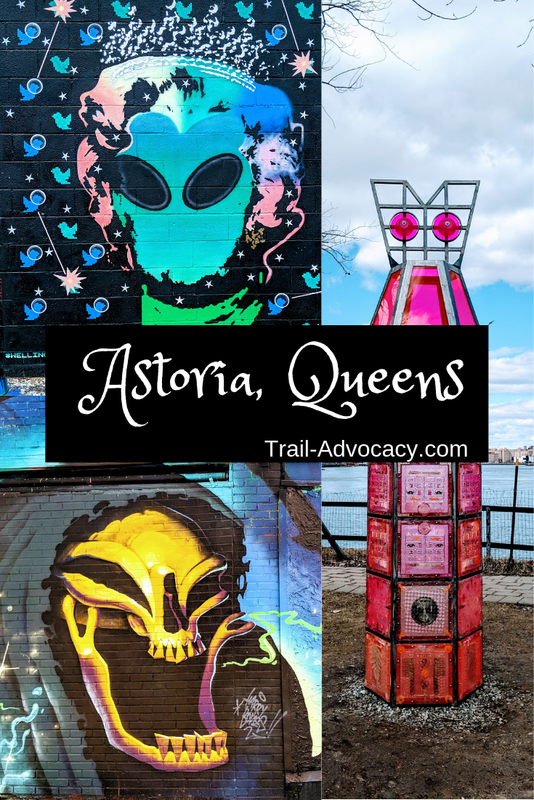 We live in Long Island City, Queens and we often visit our regular haunts in and around the area. 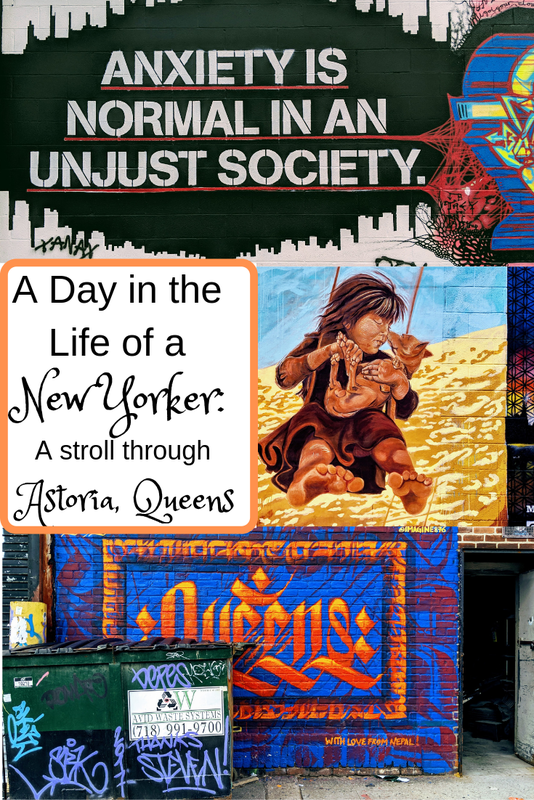 Yesterday we decided to go north instead of south and take a stroll through north LIC/Astoria. We had an awesome day and walked around 8 miles! We saw everything from amazing sculptures, to blocks and blocks of street art, and topped it off with a great beer. We started our journey when our stomachs started rumbling and headed north from Court Square under the Queens Bridge to Ramen Shack. Ramen Shack is home to the famous Ramen Burger. I personally just love their ramen. They make an almond milk-based broth that is the best veggie ramen broth I think I’ve ever had! Unfortunately, Ramen Shack in LIC is closing at the end of the month, but you can still find them at various food festivals and Brooklyn’s Smorgasburg. We filled up at Ramen Shack and headed north on our way to Socrates Sculpture Park (more on that later). On our way, we stumbled upon Troma Entertainment. As teenagers, we watched a number their tongue-in-cheek b-movies. They are gory, perverse, hilarious and almost entirely non-nonsensical. In fact, this is the studio that distributed the first movie by the creators of South Park. The most notorious character from their films, the Toxic Avenger, is spray-painted on the garage door and they have advertisements for Poultrygeist in the window. This was definitely a fun and random find. On our way here, we also saw some great street art, which turned out to be a harbinger of what was to come. Socrates Sculpture Park, as you can see from some of the pictures, is along the coast of Queens. There’s a coastline here, but there’s no swimming/sitting on the beach. While we were walking around Socrates Sculpture Park, Neal realized he badly needed some coffee. His super sniffer sussed out that across the street on the north side of Socrates Sculpture Park is Chateau Le Woof. This cafe is SO CUTE. On one side is a regular cafe. You can get La Colombe coffee and various baked goods/French-style sandwiches. On the other side, there’s an indoor dog park!! So you can take your coffee and sandwich while your dog socializes and plays. When you’re in the cafe-only part, there’s a window into the dog-cafe part, so you can watch the dogs play if you don’t want to be inside with them (or your own dog while you’re grabbing coffee). Great find! Slide through to see more! 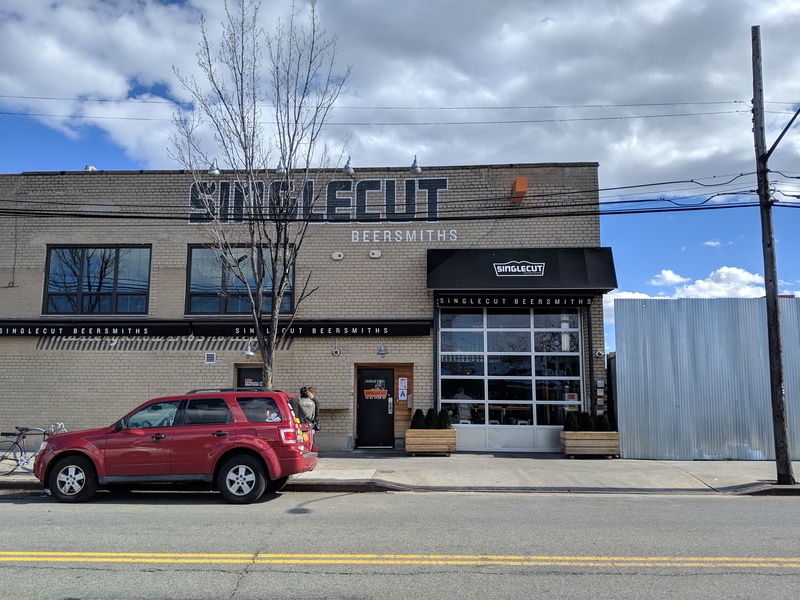 Okay, so we had walked pretty far at this point and we thought, you know, we’ve never been to Singlecut’s Tap Room… We looked at the map – another mile and a half. Hey, why not! Worth it! 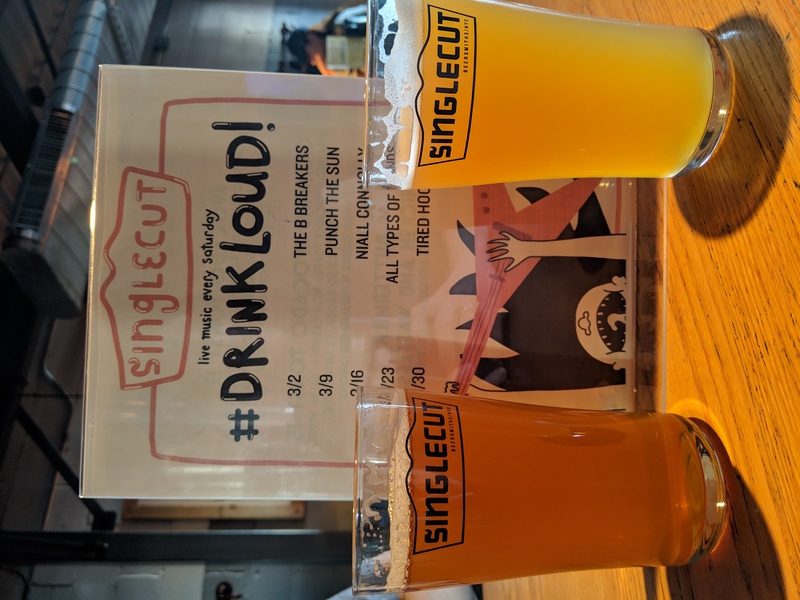 Singlecut is a music-themed brewery. They have a wall of vinyls behind the bar and all of their beers are inspired by songs and artists. Their taproom is huge with a dozen or so beers on tap and they were featuring a cask aged IPA with hemp. They had Independence Day projected on the walls! It was awesome. We tried the nachos and were surprised how good they were! It looks like they also give brewery tours (you can see the tanks from the taproom), but we didn’t opt for one. If you like breweries, you should check out our post on our favorite brewery tour in NYC here. Not far from Singlecut is the Steinway Factory. Yes, Steinway pianos. And not far from there is Steinway Mansion. This area is very industrial, so the mansion sticks out. The Steinway Mansion was built in 1856, but wasn’t sold to the Steinways until 1870. It was restored in the 1900s and designated as a historic landmark in 1966. I would love to see inside, as apparently there is some great stained-glass, but we opted out of a tour. Maybe next time. When you compare this place to the row houses just down the street, you can’t help but be jealous. It has its own space and yard like it isn’t in the middle of NYC. Very cool. At this point, we had walked close to 8 miles! We were getting very tired. The N train, what you usually take to and from Ditmars/Astoria Blvd, was down, so we hopped on the free bus back to Court Square. All-in-all this was about a 5-hour excursion and so fun! We hope you enjoyed our story! 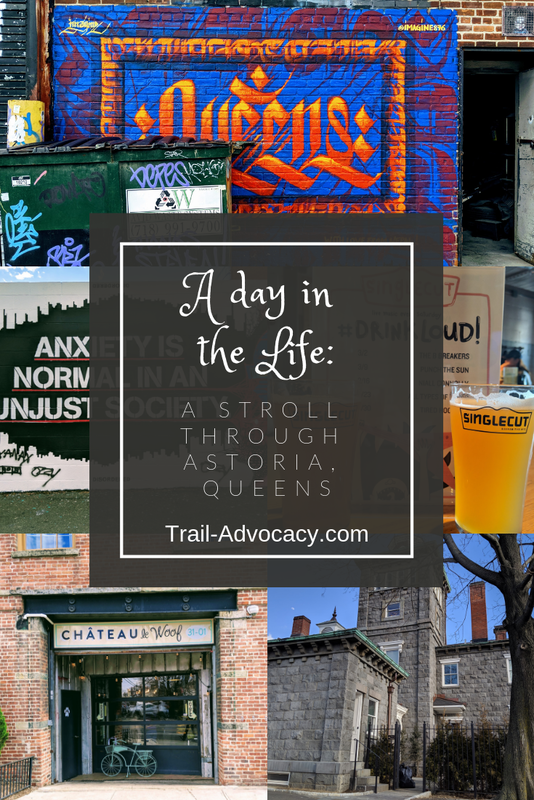 It’s part of our A Day in the Life series where we chronicle our days and give folks an idea of what locals in NYC do to have fun. We’re always looking for new things to do and share! We love exploring city street are and this stuff looks remarkable! What a place to have so close to your back door! Such beautiful pictures! Nothing beats strolling any place with an amazing art like this! It looks like a really cool place to visit. I love the green sugar-skulls mural and the ragged dog the best!